The Infinity XLC 3000 bidet toilet seat delivers what customers want. They can get a well-made bidet for a reasonable price. Many feel it has taken their bathroom to the next level, but without complicated controls. This product fits well with almost all one and two piece toilet bowls. It is offered in both elongated and round shapes. The heated seat is a nice benefit with the Infinity XLC 3000, and there are three settings to pick from. The heater can also be turned off if you would like to be economical or it is too warm to use that feature. There is a built in safety sensor for the toilet heater. The product features dual nozzles that have plenty of extra features. They include bubbles, massage, and pulse. The adjustment feature for the nozzles means you can have them moved up or down, and side to side to be exactly where you need them. With the built in Sitz bath, the Infinity XLC 3000 bidet offers plenty of comfort. This feature can be a wonderful addition for various health problems and to promote the healing of them. It can make all the difference when toilet paper can irritate such health problems in that area of the body. The remote control is a great feature that allows the user to customize the settings for their toilet use experience. The Infinity XLC 3000 features a wide remote that is easy to hold. It also has wide buttons so it isn't difficult to select the settings you want. There is a built in child mode on the remote. There is an unlimited supply of warm water with the Infinity XLC 3000, so you can take your time to get clean and refreshed. There are also three warm water settings that you can pick from in order to get the comfort you want. If you prefer room temperature water, there is a bypass option. There are also three settings for the water pressure. Once you are washed, it is time for the dryer to complete your experience. The Infinity XLC 3000 offers three heat settings for you to pick from. Overall, this product is well made with quality materials. It is simple to operate and offers a complete washing, drying, and cleansing solution. The Infinity XLC 2000 fits almost all one and two piece toilets. The one exception is toilets similar to the below design. 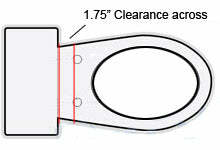 Infinity bidets have a wider rear than some of the other brands, they will fit toilets with flat tanks and a 1.75" clearance between the mounting holes and tank (see image below), and also some toilets with some curve.